Our top pick of the week is The Palm Beach Story (1942) starring Joel McCrea and Claudette Colbert. It will be released Tuesday on DVD and blu-ray by The Criterion Collection. The Palm Beach Story (1942 is an hilarious screwball comedy about marriage and divorce among the idle rich and one of director Preston Sturges best films. 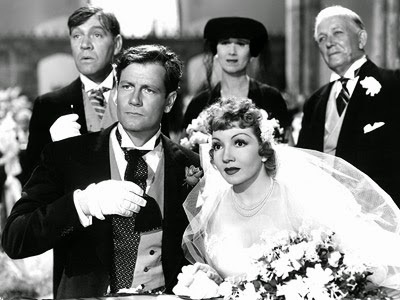 The Palm Beach Story follows married couple Tom (Joel McCrea) and Gerry Jeffers (Claudette Colbert) five years after they are first wed. The couple are still in love but mired in debt. They can't pay the rent on their luxury apartment and Tom needs $99,000 to fulfill his dream of building a "suspended airport" in the middle of the city. Gerry decides the only solution is for the couple to divorce, so she can find a rich second husband to finance Tom's scheme. Gerry meets the perfect candidate on the train to Palm Beach: the naive and shy John D. Hackensacker III (Rudy Vallee) who also happens to be one of the richest men in the world. By 1942, Sturges was one of the leading writers and directors in old Hollywood. His last two films, Sullivan's Travels (1941) and The Lady Eve (1941), were box-office smashes, giving Sturges, who both wrote and directed his films, complete creative control over The Palm Beach Story. 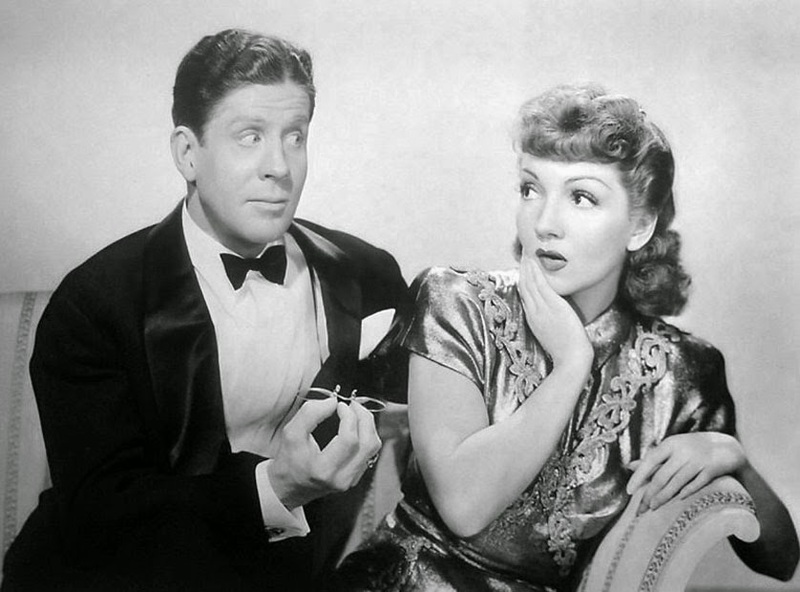 Millionaire John D. Hackensacker III (Rudy Vallee) romances Gerry Jeffers (Claudette Colbert) in The Palm Beach Story (1942). Sturges originally flirted with the idea of making a film about a mortal married to a witch (that idea was later turned into I Married a Witch (1942) starring Veronica Lake), but instead he turned his sharp wit onto what he liked to call "the idle rich." Sturges was familiar with the subject: he came from a well-to-do background himself, often visiting Palm Beach with his friend and heir to the Singer sewing machine empire, Paris Singer (Singer was an interesting character in his own right. There's more about him here). Sturges was also married to heiress Eleanor Hutton for a time, which gave him even more material. In his autobiography, he freely admitted drawing from those times for The Palm Beach Story's script. "Millionaires are funny," he wrote. 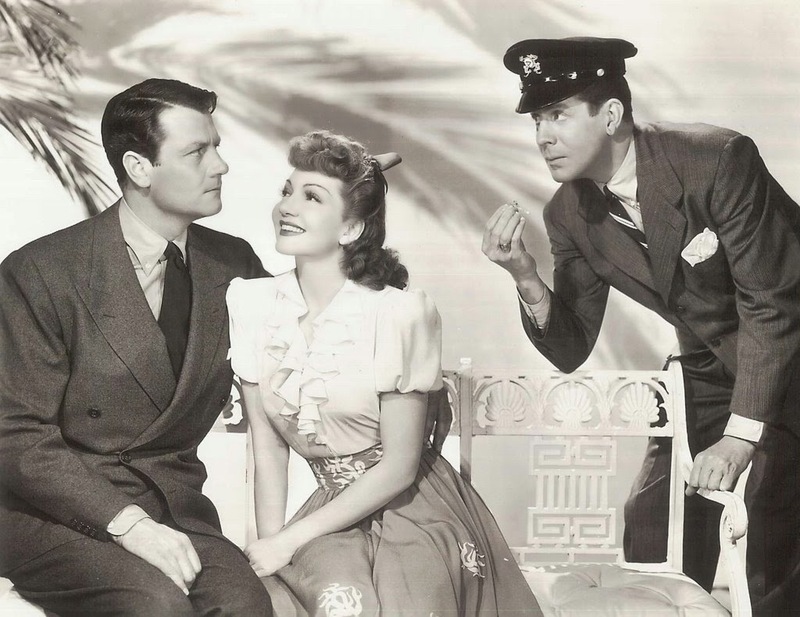 Joel McCrea, Claudette Colbert and Rudy Vallee in a publicity still for The Palm Beach Story (1942). The Palm Beach Story is a delightful film that feels like a return to the screwball comedies that were so popular in the thirties. One of the most memorable moments in the film is the inventive open credits, which aren't fully explained until the end of the film (clip below). The Palm Beach story is full of brilliant performances from many members of the Sturges stock company. The drunken members of the Quail and Ale Club, whom Gerry meets on the train to Palm Beach, feature many familiar faces from Sturges' films including Chester Conklin, Jimmy Conlin and the unforgettable and always hilarious William Demarest. 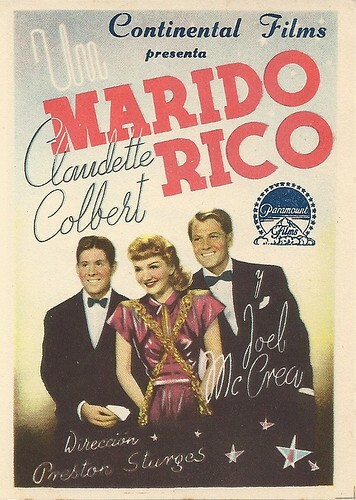 A Spanish-language poster for The Palm Beach Story (1942). The title translates as "a rich husband." Mary Astor was not part of Sturges' stock company, but she gives an hilarious performance as Hackensacker's sister, the much-married and man-crazy Princess Centimillia. Crooner Vallee also gives a fine performance as the quirky Hackensacker, a millionaire who rides in the economy class and fusses over buying a 75-cent breakfast. 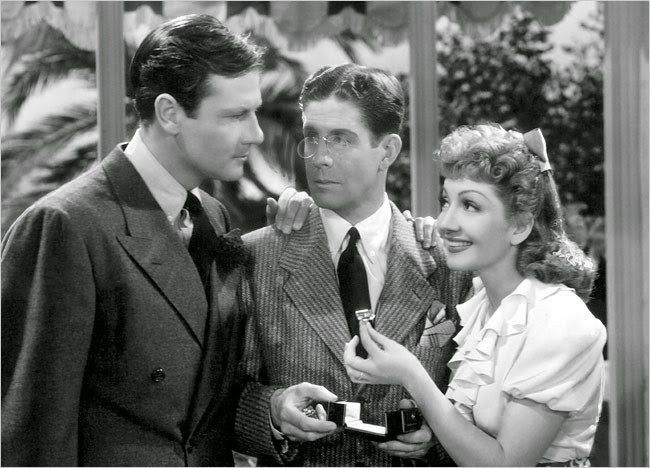 Millionaire John D. Hackensacker III (Rudy Vallee) presents Gerry Jeffers (Claudette Colbert) with a huge engagement ring as her jealous husband (Joel McCrea) looks on in The Palm Beach Story (1942). The Criterion Collection DVD and blu-ray has several special features including interviews with comedian Bill Hader and film historian James Harvey and a 1943 radio broadcast of The Palm Beach Story.